County: Roscommon County Grade: Intermediate Name: Jennifer Higgins Club: Western Gaels Position: Midfield Occupation: Food Dudes Project Manager Toughest opponent: Laura Fleming When did you start playing Ladies Gaelic: 8 years old High point of your career to date: Captaining the Roscommon Intermediate team and my club team, Western Gaels, the last two years Biggest Disappointment: Not having won the Connacht Intermediate Championship yet Favourite Player: Female: Caroline Oâ€™Hanlon (Armagh) Male: Kevin Higgins (Roscommon) Nickname: Jenny Favourite ground: Nash Park - Frenchpark Favourite ladies gaelic football skill: Outside of the boot pass or score. 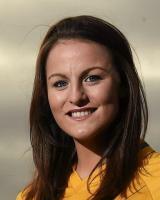 Ladies Gaelic Football Achievements: Roscommon County Player of the Year 2015 Captain of the Roscommon Intermediate Ladies Football team 2015 & 2016 Captain of Western Gaels Intermediate Ladies football team 2014 & 2015 Team of the League 2011, 2012, 2013, 2014 & 2015 Captain of Roscommon u21 team 2013, Minor team 2009&2010 and U16 team 2008 Member of the Connacht Ladies GAA interprovincial team 2012, 2013 & 2014 ITSligo Player of the Year in 2013 Recipient of The ITSligo Sports Scholarship award 2012/2013, Recipient of the Connacht Bursary Award 2013, County titles with Western Gaels at various levels Influences on your career: My brothers have had the biggest influence on my career as, being the youngest and only girl, I always looked up to them growing up and probably wouldnâ€™t be playing if it wasnâ€™t for them. My supportive parents, friends and boyfriend also have had a huge influence on my career and of course all the coaches I have had over the years.